The Mountain Goddess is an engaging, vivid work of impressive scope, with elements from fantasy, Buddhism, and Indian culture. Shelley Schanfield’s The Mountain Goddess presents a fantasy version of ancient India that chronicles a young woman’s quest and the rise of the Buddha. This second installment in the Sadhana Trilogy possesses the grand sweep of an epic. Adventure propels the sprawling book, which is set 2,500 years ago against a backdrop of Eastern mythology and spiritualism. The historical fantasy novel engages in so much world-building that the story is preceded by maps, a lineage, and an extensive list to help keep the dozens of characters straight. The plot follows Dhara, the warrior daughter of the chief of the Himalayan Koli clan, who stumbles upon the truth-seeking yogi Mala, brings her back to camp, and can’t keep her profound wisdom from lingering in her head. The rebellious princess later seeks out Mala to study yoga, and ends up embarking on a quest that brings her to Kapilavastu, capital of the Sakyan Kingdom, and Prince Siddhartha, who goes on to become the Buddha. Dhara becomes drawn to the royal court life that the Buddha grows increasingly dissatisfied with. The author fleshes out many of the prominent characters in the massive saga, thoroughly establishing their traits and motivations. Dhara’s ambitions become clear as she dreams of conquering kowtowing kings after fierce battles while “astride a tall horse” in a “breastplate of gold,” and in lines like “Mala had not said ‘prince.’ A scion could be a girl.” In addition to its protagonist, the book features several other strong, well-developed women characters. Dialogue carries the story along, whether in royal court, a secret cave, or in telepathic communiqués between people and animals. Text sometimes shines with colloquial flourishes like “they have the eyes of hawks and can hear a rabbit twitch its ears.” Prose is rhythmic and occasionally lyrical, and passages are short and punchy. Some sections drag within the lengthy work, and extensive information bogs the story down. The book’s clear epic intents make it an intimidating read, and in places it feels like it could be condensed. Those already familiar with the Buddha will anticipate how the story plays out. 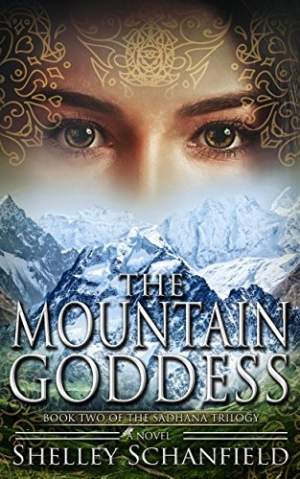 The Mountain Goddess is an engaging, vivid work of impressive scope, with elements from fantasy, Buddhism, Indian culture, and Eastern mythology. A feat of creativity and scholarship, the novel imaginatively populates the historic world that gave birth to a major faith tradition, appealing to its teachings of compassion, kindness, and the ascetic renunciation of worldly cravings.